South Lake Tahoe, CA…U.S. snowboarder Jamie Anderson won the first-ever gold medal in women’s slopestyle snowboarding Sunday, as the sport was introduced into the Olympics this year. Anderson credits the win to her family and friends, who were there to celebrate with her. Just two hours after winning gold, Anderson tweeted this photo, captioning, “Only with the love and support from the most amazing family, friends, community and sponsors! So much gratitude.” Pictured are her dad, mom and three sisters. Anderson, who has been snowboarding since she was nine years old, admits that it is an expensive sport. Forbes has estimated the annual cost to be $3,000 – $14,000, depending on how far the boarder advances in qualifying events. Training also incurs expense, with four-to-six hours spent each day, leaving almost no time for a job. However, her five sisters and two brothers also competed as children. In order to support such a large family with an expensive hobby, snowboard gear hand-me-downs were common gifts for Anderson and her sisters. Anderson initially picked up one of her sister’s old snowboardcross boards. At 13, she was the youngest person to qualify for the Winter X Games. 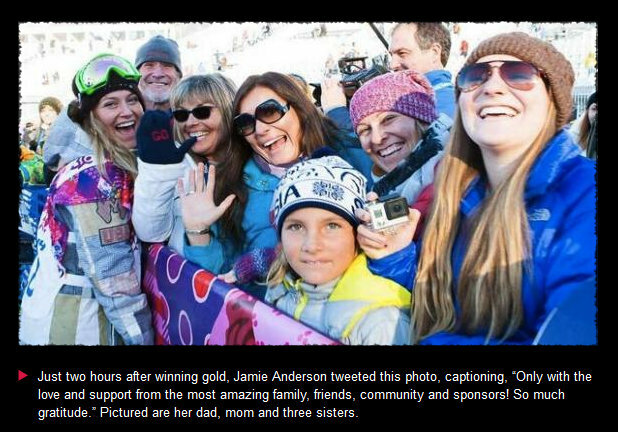 And at 15, she won her first bronze medal at the X Games slopestyle competition. Her first sponsor, Sierra at Tahoe Ski & Snowboarding Resort in Nevada had previously sponsored her two older siblings. Billabong International Limited took her to the next level financially. In 2004, when Anderson signed with the clothing company, they agreed to help pay for travel, gear and attire. In the 2006 Winter X Games, her first competition with Billabong, she beat Shaun White as the youngest person to medal in the Winter X Games. Anderson was 15 years old. After that milestone, Anderson had to wait two years before reaching the age minimum to compete in the Olympics. Then, she had to wait four more years before slopestyle became an official Olympic sport. In 2011, Anderson renewed her contract with Billabong and extended it into a snowboarding clothing line with them. Her line, which officially debuted in 2012, also helped her financially. Forty-four percent of the sales went directly to her, depending on how well the items sold. Her family made sacrifices financially, including travel, snowboarding attire and costs of maintaining a snowboard. But Anderson says she was never in the sport to make money, and the expenses taught her more about her own motivation and determination to find sponsors and gear in the long run. Those sacrifices paid dividends, as Anderson has carved a new chapter in Olympic history from the slopes of Sochi, and her sponsor now markets an Olympic gold medalist. BSU at the Games is a freelance news agency operated by 41 student journalists reporting from the Sochi 2014 Winter Olympic Games through an immersive-learning program at Ball State University. 3 Responses to "Anderson Financially Sacrificed for Historic Olympic Gold ~ Hayli Goode"